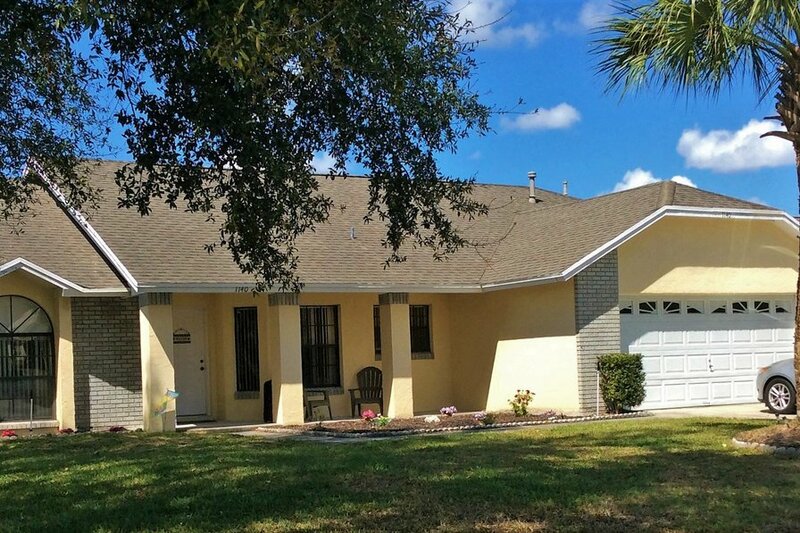 Indian Ridge is a walled community situated close to Interstate 4 and is only 8 mins. from the main gates of Disney. It is a quite residential community with amentities including community swimming pool, tennis courts & childrens’ play area. The golfing resorts of Reunion and Championsgate are less than 5 minutes away while Mystic Dunes Golf Resort borders Indianridge. This community is only 4 minutes from the bustling US 192 Highway with its abundance of restaurants and shops. The nearest retail centre comprising Publix Supermarket, CVS Pharmacy, Salon Services and fast food outlets is less than 5 minutes away. Beaches are never too far away with Clearwater on the Gulf Coast just 1.5 hours to the west, the lively Daytona Beach Area a little over an hour to the East whilst Cocoa Beach is approx. 1 hour. Orlando International airport is 30 mintues away while Sanford Airport is approx. 60 mins away. The villa has a warm, comfortable and inviting feel to it with a neutral colour scheme and decorative accessories. It is a place to unwind and relax. The villa offers a comfortable spacious carpeted living area with comfortable seating, Cable TV, DVD, Video and a Midi Music System. It also boasts a DVD and Video Library offering a wide variety of childrens and general viewing films. There is also a large selection of books for your enjoyment. There is also a formal dining area to comfortably seat 6 people. The kitchen is bright and spacious and contains everything necessary for every dining situation. Full sized washing machine and tumble dryer will meet the most demanding laundry needs. The master bedroom is spacious and bright with new bedroom furniture. It also comprises a vanity area, walk in wardrobe with a safe and an ensuite with a connecting door to the pool area. This bedroom is warm and inviting with a closet offering ample storage space. This room comprises two twin beds, bedroom furniture and a closet. The pool area comprises a 30x15’ pool and an extended deck area comprising an eating area and pool furniture for relaxing on those long hot days. The pool, facing south, has sun all day.